NPR's Morning Edition had a fantastic story yesterday. 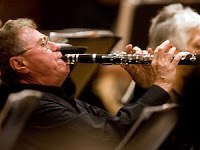 Anyone who has listened to a recording of the New York Philharmonic, or seen the orchestra live or on TV, has definitely heard first clarinetist Stanley Drucker. That's because Drucker has played with the Philharmonic for the past 60 years, or nearly one-third of the orchestra's history. When he retires at the end of June, he will have played in more than 10,200 concerts. And Drucker will be going out with a bang, including with one of his signature pieces, the Clarinet Concerto by Aaron Copland. Benny Goodman may have commissioned Copland's concerto, but Drucker owns it. He's played it 59 times with the New York Philharmonic. "The piece was written in the early '40s," Drucker says, "and it's got elements of jazz, in a way, though Benny Goodman always said, 'Play the eighth-notes straight, don't syncopate them.' It's a piece that audiences react to and respond to." Visit Morning Edition for more!